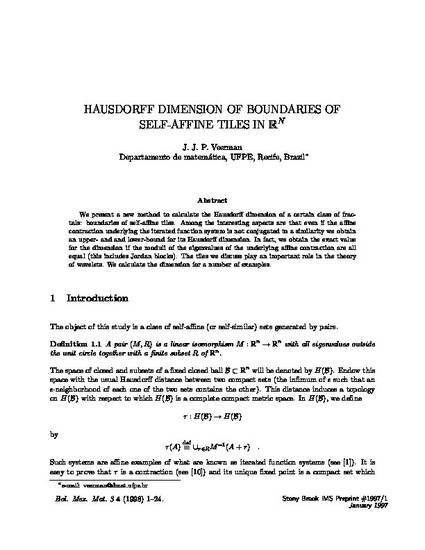 We present a new method to calculate the Hausdorff dimension of a certain class of fractals: boundaries of self-affine tiles. Among the interesting aspects are that even if the affine contraction underlying the iterated function system is not conjugated to a similarity we obtain an upper- and and lower-bound for its Hausdorff dimension. In fact, we obtain the exact value for the dimension if the moduli of the eigenvalues of the underlying affine contraction are all equal (this includes Jordan blocks). The tiles we discuss play an important role in the theory of wavelets. We calculate the dimension for a number of examples. This is the author’s version of a work that was accepted for publication in Boletín de la Sociedad Matemática Mexicana. Changes resulting from the publishing process, such as peer review, editing, corrections, structural formatting, and other quality control mechanisms may not be reflected in this document. Changes may have been made to this work since it was submitted for publication.